A routine thriller with a single new idea, Murder At 1600 cannot overcome an unfortunate regression to the most basic and predictable elements of the genre. With the United States embroiled in a tense stand-off over US servicemen held hostage by North Korea, young secretary Carla Town is found murdered in a White House bathroom (address: 1600 Pennsylvania Avenue). 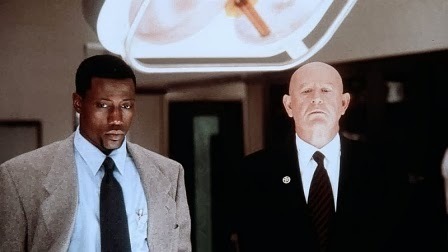 Detective Harlan Regis (Wesley Snipes) is assigned to the case, and although Secret Service Director Nick Spikings (Daniel Benzali) wants no outside investigation, National Security Advisor Alvin Jordan (Alan Alda) is interested in what Regis may come up with. Secret Service agent Nina Chance (Diane Lane) is assigned to ostensibly help Regis, although her role is really to spy on him on behalf of Spikings. When Regis and Nina uncover proof that Spikings is framing a lowly White House janitor for the murder in order to sweep the whole affair under the carpet and protect President Jack Neil (Ronny Cox), they team up to chase after the truth. They discover a sordid link between Carla and the President's son Kyle Neil (Tate Donovan), and the more they investigate, the more they become targets of harassment, threats and finally hit squads. While the premise of a dead body stuffed into a White House toilet cubicle carries a punch, and television director Dwight H. Little infuses a decent amount of style particularly early on, Murder At 1600 quickly runs out of ideas. All too predictably, the rudimentary script defaults to a series of chase-and-hide-and flee-and-shoot scenes, as Regis and Nina become targets of assassins running roughshod over Washington DC. The movie suffers from the common cheap thriller disease where the original murder is followed by several more brazen crimes, none of which attract any attention from the media or the appropriate authorities. Here there is a wild shoot-out in a tony residential neighbourhood that ends with a senior member of the White House team very dead, but that incident is somehow missed as an investigation-worthy event. The resolution of Murder At 1600 is also limp, a contrived blackmail plot that only works at the juvenile level, and an interminable White House infiltration through underground tunnels that all too conveniently ends in the hallway where the President just happens to be walking through. The exterior DC locations are attractive, although the interiors were shot in replica rooms built in Toronto. 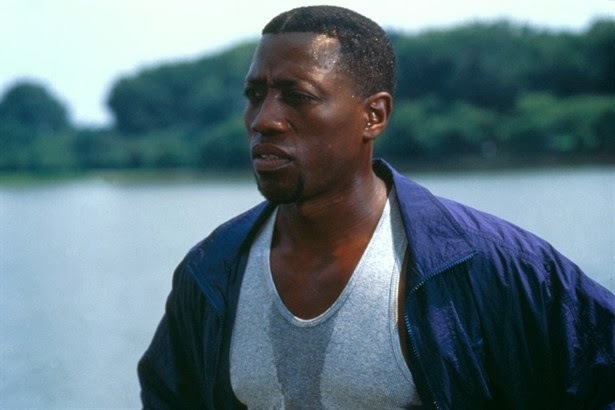 Wesley Snipes and Diane Lane do the best that they can with the material, both leaning heavily on their charisma to overcome the inherent outlandishness surrounding them. Snipes puts on his streetwise persona and gets to deliver a few cool lines, while Lane improves once she lets her hair down and decides to join the action, plausibility be damned. Daniel Benzali is too obviously crotchety, while Alan Alda provides a welcome level of quality to the supporting cast. Funnyman Dennis Miller is unconvincing as Snipes' fellow cop. Murder At 1600 has a prestigious address, but a botched delivery.